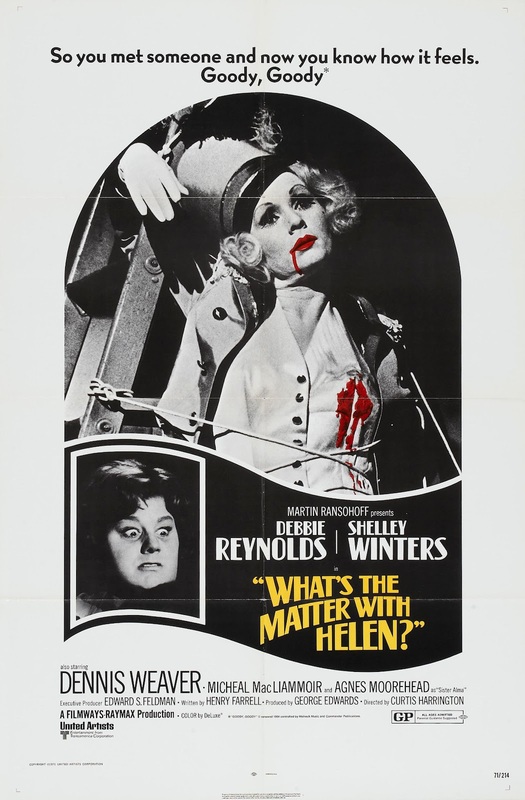 1971 camp debbie reynolds dennis weaver Forgotten Classic Horror Shelley Winters What's The Matter With Helen whatever happened to baby jane? Don't you love it when you discover a respectable, somewhat straight-laced star has starred in an off-the-wall cult masterpiece? Just think Lana Turner in Persecution or Lauren Bacall in The Fan. This is exactly the same delight that was felt when we discovered that Debbie Reynolds starred in little known Baby Jane inspired horror/thriller/melodrama from Curtis Harrington, entitled What's The Matter With Helen? Penned by the man behind so many cult psycho biddy features, Henry Farrell (What Ever Happened To Baby Jane? & Hush Hush Sweet Charlotte) and directed by cult maestro, Curtis Harrington - What's The Matter With Helen? is not a film that you will easily forget. This twisted 1930s set tale follows two middle aged women (Adelle and Helen) who move to Hollywood, California after their sons are convicted of murder. Like all runaway parents of psychotic children, the pair decide to open up a dance school for young girls hoping to make it in the movies. Adelle (Debbie Reynolds) soon falls in love with a wealthy Texan (Dennis Weaver), eager to forget her past - however evangelical Helen (Shelley Winters) has slightly more trouble doing so - discovering some of her son's tendencies have rubbed off on her. So what is the matter with Helen? Well where do we start? She's fixated on the twisted teachings of an evangelical preacher (in the form of Bewitched's Agnes Moorhead) - who she even donates her ring to, harbors a horrifying phobia/hatred of men and also appears to have a lesbian tendencies and an unhealthy attachment to Adelle. Did we mention she has lots of white rabbits? Shelley Winters could teach Glenn Close's Alex Forrest a lesson or two about bunny boiling madness. This sheer outlandish nature of the plot and leading performances makes for a camp masterpiece. The combination of Gothic atmosphere and narrative, alongside the glitzy world of a 1930s dance academy takes the cult outlandishness to a new level. Most notably one sequence where Reynolds performs a quirky dance number with several little girls. However, one must be careful not to undermine the genuinely powerful horror imagery and melodrama that Harrington expertly establishes from brooding Gothic atmosphere to gory flashbacks to key moments from Helen's life - the most shocking being her husband being shredded by farming equipment. 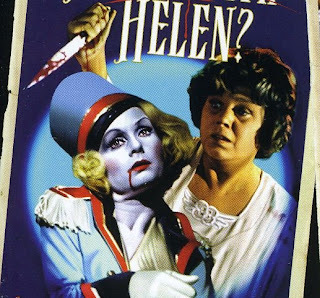 This combination of larger than life camp and brutal atmospheric horror, makes What's The Matter With Helen? one of the most exciting horrors of the seventies. Farrell's script completely utilizes Debbie Reynolds' image to full effect with the now less prominent star showing some distinct similarities with Adelle's desperate dreams of stardom that slowly fade away as she ages. This is ever present from the continual comparisons that she makes between herself and 1920s starlet, Jean Harlow. However, it is Winters who is utterly mesmerizing in the role of Helen. The star does have a tendency to overact (which makes it all the more gripping), but seeing the growing mental instability and paranoia growing in the character is fascinating. We see her begin to fall down the slow path to madness, leaving us as viewers sat on the edge of our seats, wondering what she will do next. What's The Matter With Helen? may read like a shoddy Baby Jane rip-off but Harrington and Farrell inject enough style and originality into it to create a completely unique and unforgettable cinematic experience. The blend of Gothic horror and glitzy camp, alongside two gripping performances from Winters and Reynolds makes Helen a MUST SEE. 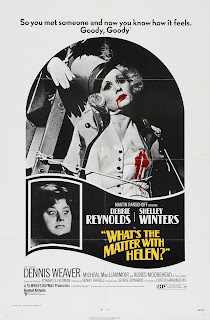 1971, camp, debbie reynolds, dennis weaver, Forgotten Classic, Horror, Shelley Winters, What's The Matter With Helen, whatever happened to baby jane?